Our filmsWe are an independent documentary film production company based in Ireland and the United States. 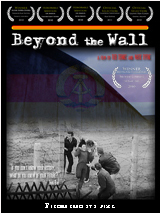 “Beyond the Wall” examines the communist era and its legacy, illustrating the endurance of the human spirit in the face of political dogma. Click on the poster to rent or buy. "Under the Hood" brings us on a journey through Belarus, where the secret police is still known as the KGB and gathering in public to do nothing is considered a crime. Click on the poster to rent or buy.